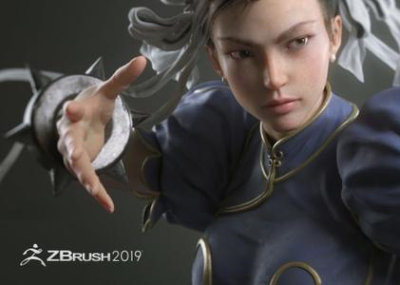 Pixologic is proud to announce the release of ZBrush 2019. The release adds a non-photorealistic rendering toolkit, new alpha modelling functionality, a universal camera, support for folders, and updates to the ZRemesher retopology system. Pixologic has revealed ZBrush 2019 with new enhancements in rendering and the introduction of Non-Photorealistic Rendering (NPR) which is an entirely new way of creating models with Snapshot3D, Folders, updated automatic retopology with ZRemesher 3.0, a Universal Camera system, and two new plugins: ZColor and Intersection Masker. First previewed at last year's ZBrush Summit, the Folders feature is the realization of one of the most popular feature requests from our users. However, in ZBrush 2019 this is more than merely a way to organize your SubTools. A wide variety of actions can be performed at the folder level, affecting all SubTools found within. Examples include performing quick 3D transformations or Live Boolean operations. Also previewed at the ZBrush Summit, this new camera system simulates a real-world camera complete with settings for Focal Length, Crop Factor and more. This allows your ZBrush scene to perfectly match that found in any other application or to mirror an imported photograph (or render). It supports undo/redo of camera movements and settings can be stored to be recalled instantly at any time. This new series of tools create a sketch style which replicates the hand drawn 2D feel and look. With the ability to add overlaying textures, apply a halftone printed paper style, draw a dark outline around the 3D model or apply a number of built-in presets, the new NPR system will open an entire world of artistic possibilities - whether you are concepting, sculpting, or preparing a final render. SpotLight v2.0 includes all the powerful projection mapping and PolyPaint features that you're already used to. It also makes it possible to convert any gray-scale image (alpha) into a 3D model. The source images can be modified in SpotLight or even combined through Boolean-type addition or subtraction to create even more complex 3D shapes. The model generated by this system can serve as a base for sculpting or even be used with the Live Boolean system to create intricate works of art. The ZRemesher automatic retopolgy toolset has been a key component in the modern ZBrush artist's workflow. It now goes to the next level with ZRemesher v3.0. The enhanced systems can maintain creased edges and automatically detect sharp surface angles, ideal for mechanical models. The result is also a more efficient final polygon count. all while actually increasing speed! The Intersection Masker plugin (included in all ZBrush 2019 installations) allows you to generate a mask where geometry islands intersect on a selected SubTool. It's the perfect solution for creating complex masks with just a few clicks. The ZColor plugin (also included in all ZBrush 2019 installations) is your new color manager for any digital painting tasks. It features a set palette of colors, chosen to best express the mood you wish to create and allowing for consistent results. ZColor files can also be shared with others, helping teams to create a cohesive look across projects. With an arsenal of features that have been developed with usability in mind, ZBrush creates a user experience that feels incredibly natural while simultaneously inspiring the artist within. With the ability to sculpt up to a billion polygons, ZBrush allows you to create limited only by your imagination. Pixologic, Inc. develops, markets, and supports software tools for film and video, games, graphic design, and illustration markets. The company offers ZBrush, a graphic application aimed at simplifying the science behind generating computer graphics by providing tools that give digital artists intuitive and visual control over the digital images they create. Its application synthesizes 2D and 3D capabilities in a single stand-alone tool, which enables users to sculpt and paint with various polygons. The company sells its solution through authorized resellers, as well as online for Windows and Mac platforms. Its solution is used in movies and VFX, games, illustration, advertising, 3D printing. Mac OSX: 10.10 or above.